However, while Android phones are hot sellers, its owners aren't the most satisfied with their handsets, according to Nielsen. The study indicates that only 71 percent of Android customers are likely to keep their handset come upgrade time, with 21 percent of Android owners saying they'd like to switch to an iPhone. iPhone customers, on the other hand, are a little more satisfied with their handset, with 89 percent planning to stick with the iPhone when it's time to upgrade and only 6 percent saying they are planning to switch to Android. It's important to note numbers from the Nielsen report do not include the month of July, which leaves out sales numbers for the iPhone 4, and backordered Droid X, as well as any negative feelings iPhone owners may now have about the handset after experiencing antenna issues. 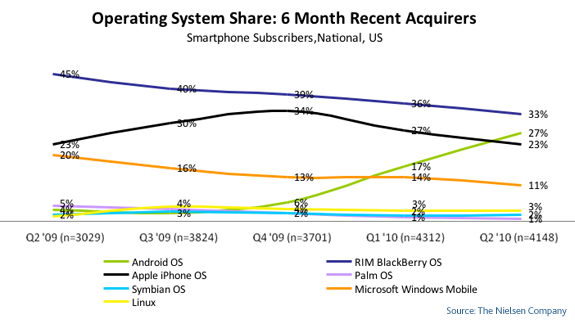 That said, the king of the smartphone market remains RIM. 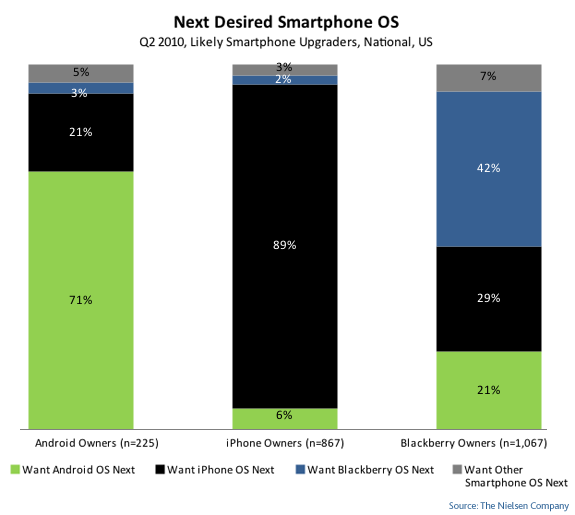 BlackBerry users account for 33 percent of overall smartphone owners. If the report is any indication however, RIM won't be on top for long. Only 42 percent of BlackBerry owners say they want to keep the device, with 29 percent interested in switching to the iPhone, and 21 percent considering an Android handset. BlackBerry users may change their tune come Tuesday when at a press conference RIM is expected to announce an iPhone-esque BlackBerry 9800 that will include features similar enough to competing handsets (iPhone and Android). If so, that might keep customers happy and loyal. Android has been growing rapidly, with Android sales growing an astounding 866 percent in the past year according to a separate report by research firm Canalys. With numerous manufacturers creating a wide variety of handsets, Android is in a position to potentially remain on top of Apple and even overtake RIM in the future. What smartphone do you use? Do you plan on sticking with it, or making a change?